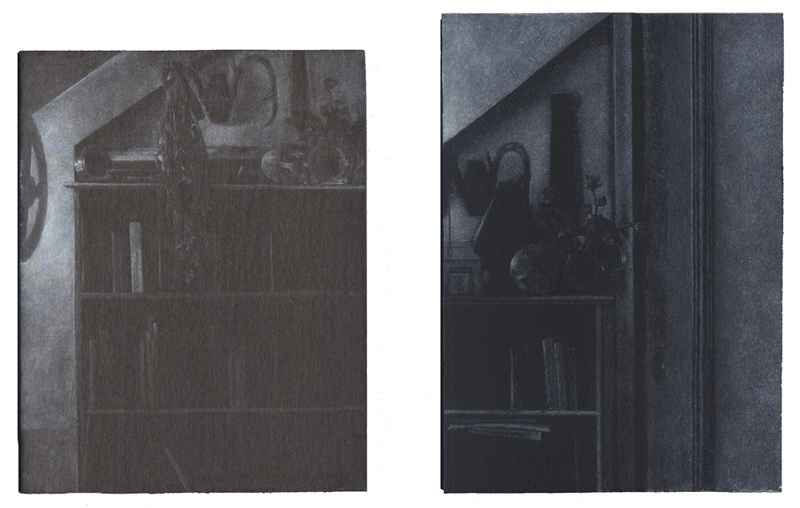 Charles Ritchie, two uncatalogued paintings, (left) Paper Whites, 1990-1992, 5 x 3 7/8″, (right) Roses, 1992, 5 3/8 x 3 7/8″, oil on gessoed mat board. Previous experience can inform the new unexpectedly. While working at Center Street Studio print workshop, I was exploring a new medium, whiteground (see entry, New Print Project: Part 5). At first I felt very comfortable using the material; it reminded me of working up paint with a brush and water as I do with watercolor. My collaborator, Jim Stroud had also eased me into the project by providing the whiteground in a small, porcelain dish like the ones I use with watercolor in my studio. However, the as I painted on the copper plate with the whiteground its unique handling properties emerged. Every brush stroke seemed to be amplified. Streaks and marks left by the brush were extremely hard to soften and blend. Part of the reason was the lack of friction on the very slick copper on which I was painting. 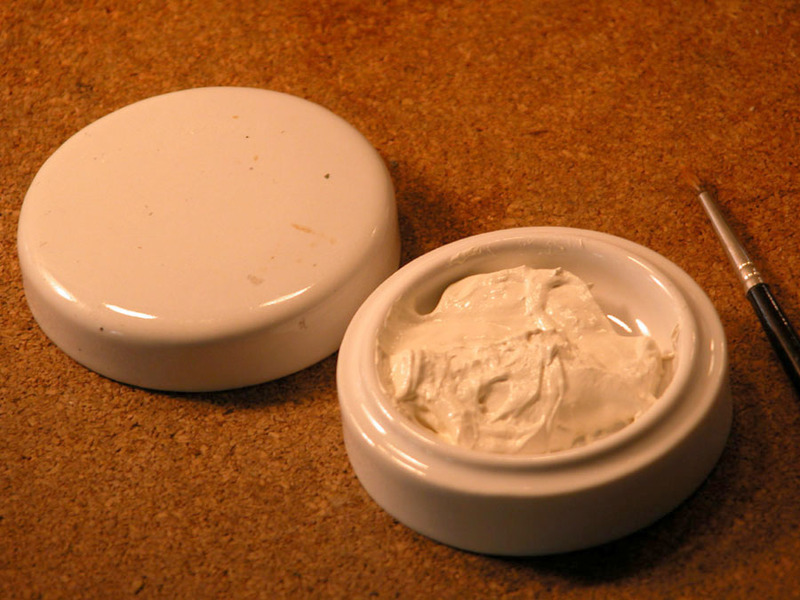 Jim helped improve the adhesion properties by adding more soap to the painting medium. Still, it was very hard to get an even tone until I finally discovered that by building an evenly mixed puddle of paint and flooding it in a shallow layer, it would dry as an even tone. I also discovered that by putting such a mixture over previously applied textured areas could soften and unify the tones. As I was working I suddenly recalled a series of small paintings I did using white oil paint, linseed oil, and turpentine painted on a dark ground. (see Roses and Paper Whites, images above). I did practically the same thing, build are reservoir of color and flood it onto the ground to make the paint spread evenly. I must have drawn on this experience subconsciously during my attempts to solve this whiteground application problem. Perhaps the reason that they are similar is that linseed oil is an agent common to both processes. In hind sight, the week making prints at Center Street Studio was spent solving the technical problem of paint application. It is interesting that my expectations of exploring a slowed down application of tone never transpired (see online journal entry, Guitar Lessons). Shifting speed was not the solution; altering the medium was. Perhaps the lesson is that having expectations is neither good nor bad but what is most important is being responsive to the process; being prepared for what happens and using experience to problem solve. “You’ve got to get in to get out”. 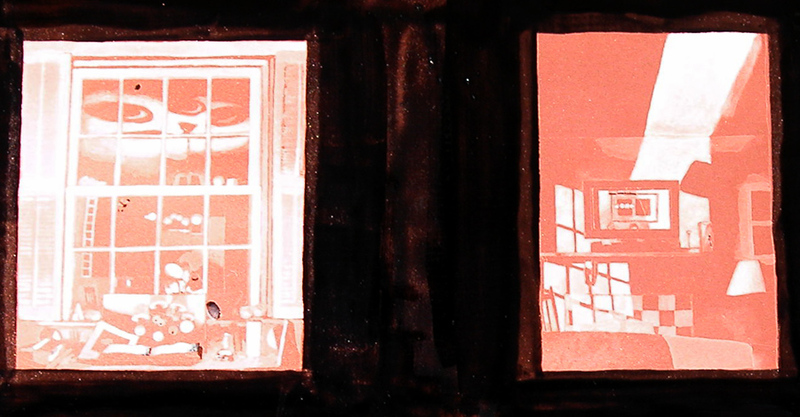 Detail showing two images from Plate 2 of the Accordion Fold Print painted in whiteground on copper plate. Images are approximately 3 1/2″ tall. The copper surface shows under the painted whiteground. Black hardground surrounds the images and is touched into the images in several places. Both grounds will block the acid when the plate is immersed in an acid bath to cut recessions for holding ink when printing. Photograph of whiteground in porcelain dish. This material is painted on the printing plate and to block corrosion in selected areas.